One of the things that makes Gretsch guitars stand out from the rest of the pack is the unique tailpiece options the company has utilized over the years. Of course, not all guitars boast one of these metallic accoutrements, but the ones that do seem to suggest a souped-up elegance. 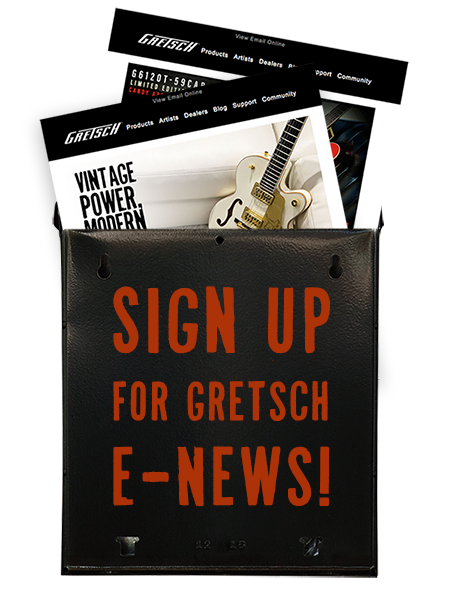 Both utilitarian and aesthetically-pleasing, here is a look at the main tailpieces you’ll find on a Gretsch guitar. Developed by Paul A. Bigsby, these vibratos allow the player to bend the pitch of notes or chords with their pick hand with the help of a spring-loaded arm called a whammy bar or tremolo. Available on Gretsch guitars since the 1950s, the device also makes sure the instrument stays in tune while adding those bending effects. Bend the arm down toward the guitar and the strings will loosen, lowering their pitch. Release the arm, and it’s back to normal. You can see Bigsby Vibrato Tailpieces on the 1958 Chet Atkins Country Gentleman, the G6118T-LTV 130th Anniversary Jr., the 1959 Chet Atkins Solid Body and the Duane Eddy Signature Hollowbody, among several others. A hallmark feature of the Gretsch Falcon and Penguin, the hand made “G-Cadillac Tailpiece” symbolizes grace and elegance. Originally made completely by hand in Gretsch’s Brooklyn, N.Y., factory, one thinks of a top-shelf model. The G-cutout tailpiece is seen on most Country Clubs and Anniversaries, as well as some Jet models. This simple, stamped brass design has become somewhat of a Gretsch hallmark, and is still used on most non-vibrato equipped Gretsches today. The thick plate is nearly a work of art and unmistakably Gretsch. You can see the G-cutout tailpiece on the 6118 Anniversary and the G6128TVP Power Jet. The Synchromatic 400 “Chromatic Tailpiece” or stairstep tailpiece is an exclusive Gretsch feature. The tailpiece is designed to compensate for differing string gauges, thereby reducing tension and equalizing playing finger pressure. The tailpiece makes playing easier with uniform finger action.